Your Welcome Letter provides you with FTP access to their home directory. To establish an FTP connection, you will need the following pieces of information: FTP login, FTP password, and FTP host name. 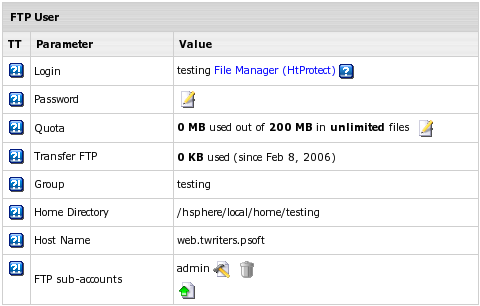 To find this information, select FTP User link in FTP/User Account menu. Login is the login to be used to enter a user directory via FTP. It is automatically generated on the basis of the account name. Note: instead of using an FTP client, you may choose here the built-in Web-based file manager WebShell by clicking the File Manager (HtProtect) link. Password is by default the password associated with your username. If necessary, you can change and hence make it different from you control panel password. Host Name is a web server domain name to be used to access files via FTP. At the bottom of the page that shows, find FTP sub-accounts and click the Add icon. On the next page, enter the FTP login and password that will be used by this other user, and the directory this user will be restricted to. The directory must be relative to your home directory. If you leave the directory field empty, FTP sub-users will have access to your whole home directory. How can I schedule scripts to run at certain times?